The Kia K900 is one of the most improbable and unlikely models from a mainstream manufacturer. 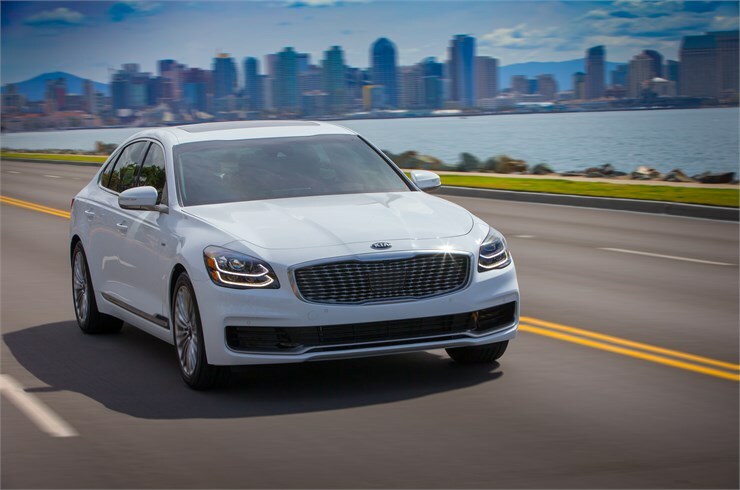 Sophisticated and elegant, the 2019 Kia K900 seeks its own place in a niche segment. Introduced in 2015, the K900 immediately gave Kia an entry in the niche full-size luxury sedan segment. That segment is occupied by the likes of the BMW 7 Series, Lexus LS, Mercedes-Benz S-Class, Jaguar XJ and the Audi A8L. Sales of the K900 never accounted for much, so after three years it appeared Kia would pull this model from the U.S. market. Instead, the automaker skipped the 2018 model year and has an all-new sedan ready for 2019. Yes, despite NBA superstar LeBron James serving as the K900 spokesman, Kia has only managed several hundred models sold each year. We’re not sure what Kia expects the 2019 K900 to do, but it is safe to say it will once again serve as the brand’s flagship model with distinction. 1. The K900’s overall dimensions are larger. Forget downsizing! The 2019 Kia K900 is upsized slightly over the previous model. It is longer, wider and taller than the 2015-2017 version. From wheel to wheel, this sedan measures 122.2 inches, up from 119.9 inches. From bumper to bumper, the increase is smaller. At 201.6 inches, the new model is one inch longer. Its width increased slightly to 75.4 inches from 74.8 inches. From a height perspective, the change is even smaller, increasing by just 0.2 inches to 58.7 inches. The interior space appears to be roughly the same. We’re not sure what the trunk dimensions are for the new model, but we’re thinking they’ll come in better than the modest 15.9 cubic feet of the previous K900. 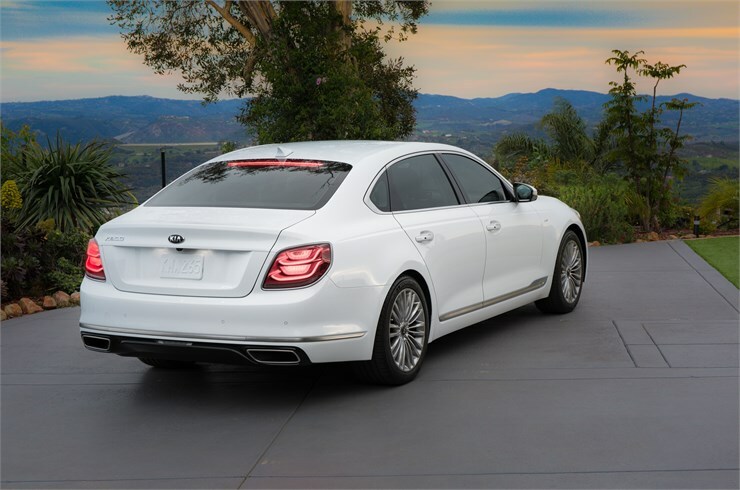 Bentley-like design elements grace the Kia K900. 2. One engine is better than two. The previous K900 came with two engine choices: a 3.8-liter V6 and a 5.0-liter V8. Both engines are gone, replaced by a single twin-turbo 3.3-liter V6 with 365 horsepower and 376 pound-feet of torque. Importantly, the new engine effectively splits the horsepower differences between the two previous engines, while matching the torque of the V8. An 8-speed automatic transmission sends power to all four wheels. Yes, all-wheel drive is now standard. 3. State-of-the-art technologies live here. Kia Motors has long pushed its technology prowess through its UVO telematics system. The new Kia K900 demonstrates just how savvy this automaker is. For starters, you’ll find a 12.3-inch Human Machine Interface (HMI) touch-screen. This system displays maps, trip details, audio information, manages climate control and oversees other details. Also, the K900 has a new navigation system. All these things tie in with a dedicated service representative reachable via a VIP phone line. Other tech features include Android Auto and Apple CarPlay smartphone compatibility, an available 9.7-inch head-up display, and a 17-speaker Harmon Kardon surround sound system. 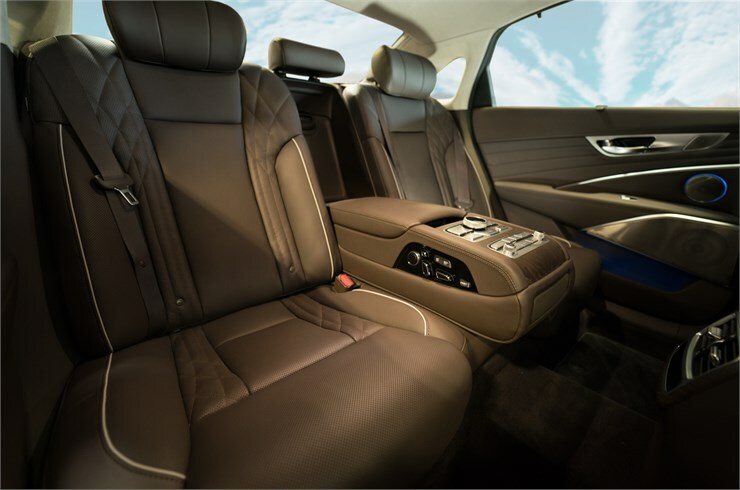 Fine leathers and choice woods dress the K900’s interior. Among the safety features you’ll find Kia’s Advanced Driver Assistance Systems (ADAS), which includes a surround view monitor that has four cameras that provide a 360-degree perspective. The Blind Spot View Monitor (BVM) supplies the driver with a live feed of the adjacent lanes in the instrument panel. The system kicks in with a flick of a turn signal. Other advanced safety features include lane keep assist, forward collision avoidance assist, and driver attention warning. You’ll also find rear cross traffic avoidance alert, safe exit assist, lane follow assist and advanced smart cruise control. The latter system utilizes lane markings and radar-front vehicle information to keep the K900 centered and sufficiently behind the vehicle immediately in front. 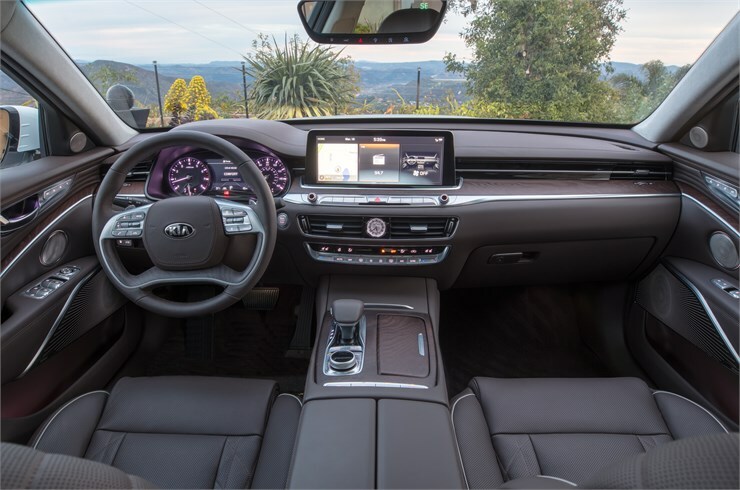 The Kia K900 offers a high-level of luxury befitting a sedan of its class. Soft leathers cover the seats and wrap the interior. Wood trim choices include walnut, olive ash, beige olive ash and engineered wood. Kia says the front seats are well contoured and designed to supply optimum support and comfort in an effort to reduce fatigue. In a nod to Korea’s history, the quilted leather at the shoulders point to the clothing worn by Korean kings of antiquity. Key features include heated and ventilated seats up front. An available 20-way power driver’s seat comes with width-adjusting bolsters and lumbar support. The front passenger has a 12-way power seat. The rear seats have their own advantages as the one on the driver’s side offers 12-way adjustment and the one on the right side 14-way adjustment. Both seats have reclining capabilities. Heating and ventilation options are also available for the outboard rear seats. The rear compartment seats three, but is ideal for two passengers. 5. Pricing to be determined. We’ll update this page when pricing information becomes known. The previous model started at $49,900, plus a $950 destination fee. That model offered three trims: Premium V6, Luxury V6 and Luxury V8. We think the new model will cost at least $55,000 based on the improvements in performance and content alone. That’s still $20,000 less than a Lexus LS which, by the way, is also now powered by a twin-turbo V6 engine. As unlikely that there was a K900 in the first place, introducing an all-new model is a bold move on Kia’s part. Likely, sales will remain slow, although the sedan could find its way into livery fleets. After all, the Lincoln Town Car is long retired and not every limousine is a full-size SUV. If Kia sends us a 2019 K900, we’ll supply a review and update this page with a link. Kia K900 photos copyright Kia Motors.